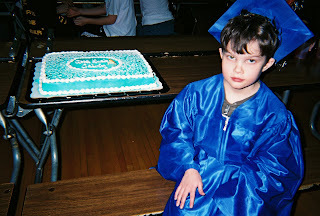 Image: My son at his 'graduation party' on his last day at his former elementary school. It was held in the school school cafeteria. Five professionals, two classrooms and a couple of guests (me and a aide's teenage daughter) attended for a total of approximately 40 people. We had one or two pieces of cake left! 1. Put a positive spin on the move. As my child's most recent move was due to his being unhappy with being in a younger classroom, he was told he was graduating from the old school to the new one with a classroom of older children. It worked beautifully for my son (who is outgoing and loves attention, which may not be the case with other, more shy children.) He was so proud! 2. If you know the new teacher, help bridge the gap between the parent/child and the educator. 3. Plan a going away party and encourage the parent to help. If the child also attends a regular education room, be sure to include his other teacher and classroom. 5. Have each child in your classroom make a card. My son's third grade teacher did this and my son received 23 cards (most with frogs on them!) as well as two books about "froggies." 6. Social stories can help immensely. Either write one about the impending school switch on your own or ask the speech therapist to help if appropriate. Note: This was the third and final part of my series on school transition strategies. Part I was about what parents can do to help their child with ASD transition to a new school. Part II was about what new (to the student) teachers can do to help incoming children with ASD adjust to the new classroom. Image: Recently My child has made the successful transformation from being a Vowles Viking to a Pullen Panther (Yes, I know that is quite the metamorphosis!) and has adjusted to attending a new school. Part of the success, was due to the implementation of the strategies listed near the end of this post. My oldest son with a mild form of autism spectrum disorder (ASD) has finally done it. As of March 9 he's attended all four K-4 elementary schools in our district--and we have not moved one single time. Over the last five years that we've lived in the same house, my son has attended four different schools. It's not that he's been kicked out. It's not that any of the schools do not want him as a student. It is that he started attending the Mildly Cognitive Impaired (MiCI) classroom (with half days in a regular ed room) at the wrong time, thus getting caught in a stream of organizational shifts. That said, he's been a Ganiard Gator (1 year), A Rosebush Rocket (two years) a Vowles Viking (1.5 years) and a Pullen Panther (all of two weeks and running). The bad news is that I became a bit irritated with all the school changes. The good news is that I and the rest of my family have become pretty good at transitional strategies when it comes to getting a person with ASD to switch schools. I have a small list of strategies to share. Today I will share Parent strategies. Tomorrow I will share strategies for teachers of new students, and the next day I'll post about what what current teachers can do to help their student transition to a new school. 1. The easiest place to start might be taking the child to visit the playground at the new school. Usually, the playgrounds can be visited at anytime. 2. Next, schedule a visit alone to observe the teacher with her/his students in the classroom. 3. Make a one page resume about your child to give to the new teacher when you go to your visit. Put a small photo at the top of the page along with the basic info (name, age, etc). Add in likes, dislikes, strengths and weaknesses. Limiting the 'resume' to one page will help to ensure that the new teacher will not become overwhelmed with too much information. 4. Schedule a 'field trip' to take child to see the new school. Use a social story or visual aids so that they know that the field trip is just a visit and not a permanent situation yet. Along with asking for some time in the new classroom, also ask to meet the principal and take a tour of the school. 5. Make sure your child knows exactly what day they will start attending the new school. Visual schedules or merely putting a note on the family calendar might help. 6. Communicate on a regular basis with both the new and the current teacher. 7. Look up the new school on the web. Show the child any appropriate pictures of the school, teachers, etc. and read a little bit from the website if there is something that might interest your child. 8. Keep a positive attitude. As a parent, I know that it is easy to become overwhelmed and even a little depressed about a new school switch. However, negative feelings and attitudes are usually non-productive. A positive attitude will be more helpful to your child than a negative one. 9. Keep in mind that morning and afternoon routines might change at home due to a change in transportation to and from school (going from riding in the family car to riding a bus, for example). Communicate with your child about the transportation and resulting schedule changes. Image: The book we forgot to send to school for favorite book day. It was my son's turn to bring in a book. He didn't seem to mind the error, but I sure did! We love to read in this house. My husband is a librarian and I'm a good, little, bun-wearing librarian's wife! We read every day. I've been helping my kids' with suggested reading activities this month. Below are the chronicles of success as well as the documentation of, gulp, a reading month failure. Tonight my ten year old with Autism Spectrum Disorder brought home a book to read for homework. He read his book to us during our normal bedtime routine. Usually I read both boys' choices, but today I just read the little guy's pick and sat back and let the big one do his homework. He did a good job reading Sarah and the Barking Dog by Jenny Giles. Wear shades to school for Hollywood day (theme at school for reading month is Lights! Camera Action), Bring a favorite book to school (Color Kittens by Margaret Wise Brown), Wear a hat to school, Wear a button to school; Wear workout clothes, Watch (or perform in as my two guys did) a talent show, Bring a joke or riddle to school (my little one brought several kitty knock knock jokes), and wear cozy pajamas (the little guy has really cute blue owl pajamas he proudly wore on this very day). My oldest son attended the school with the very full reading calendar up until March 9 and now attends another school that has an older Special Education class. Fortunately that school doesn't have a calendar of activities or I would have a heck of a time keeping up. Unfortunately we missed doing one little thing for that school because my mind was still full of calendar activities as well as strategies to get the school switch to go smoothly. I was supposed to help my oldest child pack his favorite book in his backpack to take on Monday (March 16) and I forgot! Maybe it's also because both boys' have to take library books back on Monday and we couldn't find one of them. More success or one, two, or more mistake(s)? Tomorrow my little one is planning to take in a book to trade while also bringing a book order in for his Kindergarten class visit to the school book fair. He is also supposed to bring a blanket and pillow to school so that he can participate in a onetime, hour-long, after school reading program. Hopefully, we'll remember everything! Image: The green shirt my son wore today. It's supposed to be 60 degrees Farenheit today, so he left off the hat! As an elementary school student in the 1980s, I took special care to wear green to school each year St. Patrick's Day so I wouldn't get pinched. (OK, I also liked to celebrate the holiday wearing one of my favorite colors.) I don't remember any warnings about getting in trouble for pinching someone at school on March 17. In fact, I think I remember teachers looking the other way when that happened! Nowadays, many parents and children alike do not have to worry so much about any pinching going on during the school day because of the fairly new and welcome trend of anti-bullying policies supported by school systems. As a parent of one boy with special needs and another one who is super sensitive, I'm glad that our school system has adopted a no pinching policy. I think that having such a rule in place for March 17 is a good way to avoid a whole lot of trouble. From a child's point of view it might be fun to pinch someone, but it isn't so much fun to be the recipient! 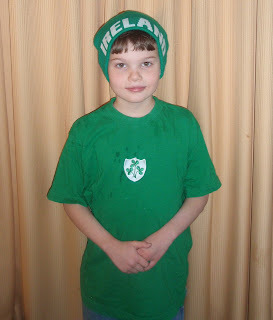 That said, after making sure that both boys wore the green shirts that I brought back from Ireland in November, I had to take special care to explain to my neurotypical Kindergartner that pinching at school would get him in trouble. I told him that if he pinched someone for not wearing green today he might get an uh-oh stick from his teacher. He knows that if he gets an uh-oh stick he won't get a prize from the treasure box for (several days worth of) good behavior. Fortunately, my child with autism didn't seem to have any interest in the pinching tradition which is good because it takes longer sometimes for those type of explanations to sink in. He also did not need much convincing to celebrate today by wearing green because like me he loves the holidays. My little one does too. So the three of us are all wearing green, while the neutral color loving man of the house is not. My little one threatened to pinch him, but I think that his dad will manage to avoid ten little fingers from an ornery six year old today. Anyway, in case you are curious, here is a link from Yahoo that gives a likely explanation of how the whole pinching tradition on St. Patrick's Day began. Happy St. Patrick's Day! 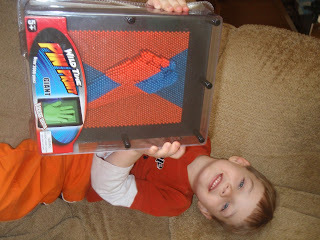 This post concludes my series on Play and the Child with Autism Spectrum Disorder. Today, I'm featuring two book excerpts taken from Teaching Students with Autism Spectrum Disorders: A Step-by-Step Guide for Educators by Roger Pierangelo and George Giuliani. This is the second of the two excerpts. "No interaction: the child shows no interest in touching or holding toys. Manipulative: explorative play: the child holds and gazes at toys; mouths, waves, shakes, or bangs toys; stacks blocks or bangs them together; lines up objects. Functional play: The child puts teacup to mouth, puts brush to hair, connects train sections and pushes train, arranges pieces of furniture in dollhouse, constructs a building with blocks. Symbolic/pretend play: the child pretends to do something or to be someone else with an intent that is representational, including role-playing (e.g., child makes hand move to mouth, signifying drinking from teacup; makes a puppet talk; uses a toy person or doll to represent self; uses block as a car accompanied by engine sounds." "Isolation: The children appear to be unaware of or oblivious to others. They may occupy themselves by watching anything of momentary interest. Orientation: The children have an awareness of the other children as evidenced by looking at them or at their play materials or activities. However, the children do not enter into play. Parallel/proximity play: The children play independently beside, rather than engaging with, the other children. There is simultaneous use of the same play space or materials as peers. Common focus: The children engage in activities directly involving one or more peers, including informal turn taking, giving and receiving assistance and directives, and active sharing of materials. There is a common focus or attention on the play. " Yearning for improvement in this area, especially when child is young. Author's Note: I have one more post planned for this series, Play and Children with ASD. The post will be about the stages of development in terms of play.